Years ago we had a dog, and moving from Africa to Ireland we had to put him 6 months in quarantine. Having been too young to understand what was happening and voicing an opinion makes me look back at that time in sadness. I believe we should have left the dog in Africa because those 6 months in quarantine completely changed him. He got very agressive and destructive until one day he actuay attacked and bit me! Unfortunately my parents couldn't keep him anymore because it was just to dangerous to have him around. I think this all could have been avoided by not putting the poor dog through all that lonelyness in quarantine. What do you think about situations like these? Would you part yourself from your beloved dog just to keep him away from such a situation? Or is it dependant on which kind of dog it is, can certain dogs cope better with quarantine than others? By the way, this is a picture of him when he was a puppy, does anyone know what breed it is? 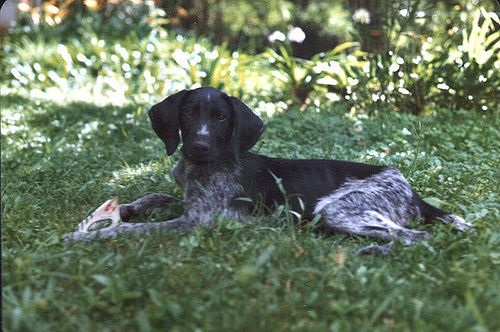 As regards the breed, could it be a cross breed between a setter and some other breed? JanNine I consider my dog as part of my family! I say the same, I consider my cats my kids and my parents already consider themselves as grandparents hehe... But considering how much work they are, and how much patience one needs it makes me think twice about having real kids! I know this is a really old post but I just felt like I had to reply to it. My partner and I were recently thinking of moving overseas for a few years but I came to think of one thing, my dogs, I don't think I would ever have the power to leave them in quarantine for a long time, nor would I have the power to leave them behind. My 1 year old is a complete mummy's boy so I could never leave him, I think it would actually break his heart, whenever I am not around everyone tells me he changes and gets very withdrawn. Also I could never leave my 3 month old, we've only had her a short time but shes so important to my life. In the end we decided to not move as I would not be able to handle leaving my dogs in either case. He's not some sort of german pointer or anything is he? I've seen a few with those sort of markings. Or not just a cross? Here in Malta for example, if the cats have the right vaccinations and papers, chips etc, they don't have to go into quarantine, but dogs must. We have a lovely dog, Lucy, who we adopted when we were living in Mauritania, West Africa - heart of the Sahara. She was 1 when she joined our family (rescued by an American woman who worked there and because of extensive travel with her work which left Lucy alone a lot, decided to find Lucy a good family) and around 5 years old now. We - hubby and two sons - transferred to Zambia, Southern Africa, three years ago and now we will leave to go to Spain where we have bought a house. We plan to be there for three to four months and then hubby will look for another expat position. Do: I give her to my best friend, who has offered to take her to Botswana with her family which includes two Jack Russells (much better for Lucy). Or: Do I take her with us (she would have to follow around a month after us) taking the risk that the next job my husband gets would allow pets to come along. Also, I know that there are strict quarantine laws for taking animals in to the UK. Of course I could get her a doggy passport in Spain. Does anyone know if, because she originated in Africa, she would be free to travel to the UK after a few months? Purely selfish reasons to take her with us I know, as I know that Lucy will easily adapt - she is such a loving and friendly dog.